Smartwatches are increasing in popularity and the insistence of every major mobile manufacturer on pushing these new devices means they're not going away anytime soon. 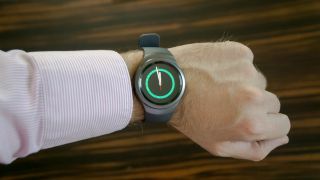 Conor Pierce, VP of Mobile and IT for Samsung, revealed to techradar that the South Korean firm has seen an uptick in wearable interest in 2015 as the market starts to straddle both the digital and fashion worlds. When pressed on just how well smartwatches were performing Pierce's response was "sales are up several hundred percent up on last year" - that's a huge gain. Smartwatch functionality is still relatively limited however. Sure you can track steps, receive notifications, reply to texts and in some cases even take calls and pay with your wearable - but for many these aren't strong enough use cases to part with the additional money. Pierce believes the best is yet to come, and your smartwatch is only going to get better with time. "Smartwatches will only become more useful. Thinking about smart home going forward, you'll be able to use it as a remote control for your home." In fact, the South Korean firm has big plans for the connected home and the Internet of Things. "The entire Samsung portfolio will, in a few years time, be 100% connected," Pierce revealed. This means the possibility of controlling everything from your washing machine and TV to your door lock and lighting from your wrist, is not too far off. Beam me up Scotty.